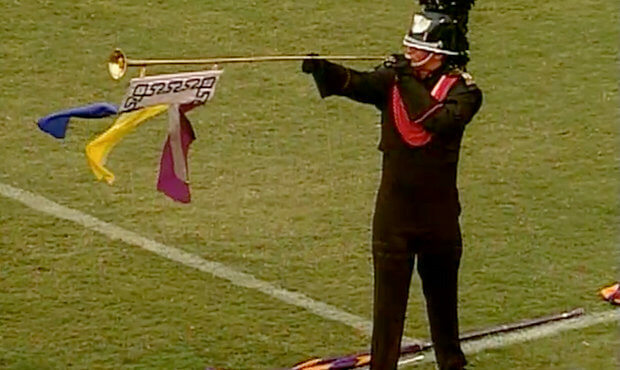 The end of the 1998 Drum Corps International Tour brought the World Championships to Orlando’s Citrus Bowl Stadium for the third year in a row. In the Quarterfinals, the Blue Devils placed first and the Cadets of Bergen County placed third, prior to each switching positions during the Finals. Glassmen achieved a historical-best fifth-place finish after not making the Finals two years earlier. Phantom Regiment, finishing in eighth place, went on an excursion to Rome with its production, “Songs from the Eternal City.” The show title was inspired by the name given to the ancient city in the years B.C., when residents trusted that Rome would endure forever as a beacon of culture and power. The show opened with Hector Berlioz’s “Roman Carnival Overture” of 1844, based on music from “Benvenuto Cellini,” an earlier not-so-successful opera inspired by the time he spent in Rome as winner of the prestigious Prix de Rome prize offered by the Conservatoire de Paris. 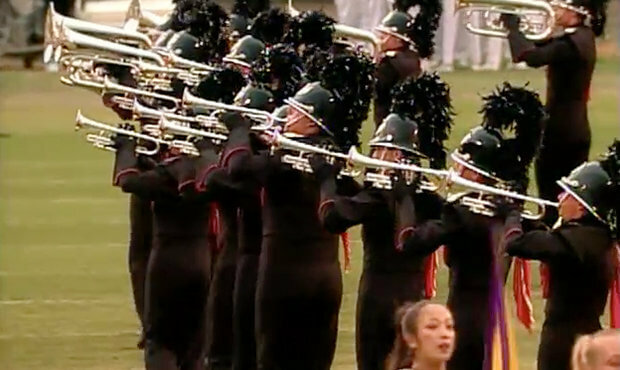 While Phantom Regiment’s version focused on the more bombastic and jubilant sections of the work, in the original score, the opening of the overture quickly led into an extended solo for English horn. It was the first substantial usage of the double reed instrument in a major orchestral composition, a century after the instrument first appeared in minor roles in operas. Giacomo Puccini wrote the aria “Un bel di vedremo (One Beautiful Day)” for his famed 1904 opera, “Madama Butterfly,” the work that was the inspiration for “Miss Saigon.” The lyrics tell the story of a 15-year-old living in Nagasaki, Japan, awaiting the return of her lover, U.S. Naval officer Pinkerton. The corps’ rendition started with the delicate melody wafting across the field, rapidly building into a forceful statement that just as quickly descended in volume, as if the horn line was sighing in recognition of the love affair that was doomed to fail. Phantom next turned to Ottorino Respighi, who wrote his 1924 symphonic poem “Pines of Rome” as the second monumental suite in his “Roman Trilogy” of works that included the preceding “Fountains of Rome” in 1917 and the subsequent “Roman Festivals” of 1926. Each of the four movements portrays scenes that took place around pine trees in various locations around Rome. The corps opened the Respighi finale of the show with “Pines of the Villa Borghese,” the first of the suite’s four movements which captures the spirit of children playing on a Sunday morning. A lone herald trumpet festooned with colorful heraldic banners introduced the opening fanfare. The colors of the banners were replicated in the flags spun by the color guard members, giving the impression of stained glass windows before leading into a percussion interlude. The final segment of the show was the “Pines of the Appian Way,” the concluding movement of “Pines of Rome.” Throughout its continual tension and drama, the ancient Roman Army is heard marching into the city, bordered by miles of pine trees lining the route in the early morning mist. Both the sounds of marching feet and the music continuously get louder as the Roman legions approach the center of the city. The corps opened this segment with the mysterious sounds of that morning mist, with a musical glimpse of the army heard over the horizon. A wooden marching machine in the front ensemble percussion replicated the sound of multitudes of feet marching in step. The piece continually increased in volume and intensity, leading into a large block triangle of horns and drums in front of arcs of massive white flags. For this week only, you can save on the Legacy Collection DVD that contains this complete Phantom Regiment performance, along with all finalists from the 1998 DCI World Championships. Buy the 1998 Legacy Collection DVD.